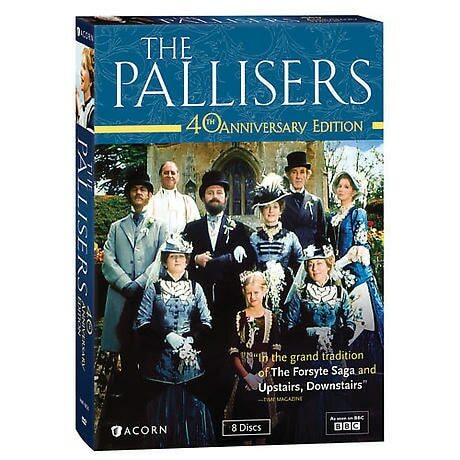 One of the most popular series ever seen on public television, this sprawling BBC saga follows an aristocratic dynasty through 20 years of wealth, passion, scandal, and high society in Victorian England. Based on Anthony Trollope's novels, set in palatial country homes and London salons, it stars Emmy® winner Susan Hampshire as Glencora and begins with her forced marriage to Plantagenet (Philip Latham, Number 10). With Derek Jacobi, Penelope Keith, Anthony Andrews, and Jeremy Irons. 26 episodes, over 22 hrs, 8 DVDs, SDH. The dull but dutiful Plantagenet Palliser and the spirited Lady Glencora are both thoroughly but unsuitably in love with others when their elders declare them a perfect match. The Duke of Omnium reminds Plantagenet that Pallisers marry for more important reasons than love. Married and off on their wedding tour, the Pallisers meet up with the Vavasor party to Glencora's great relief. With urging from George, Alice questions her engagement to John. Stifled by the boredom of their country estate and her husband's preoccupation with politics, Glencora sulks until Plantagenet suggests she invite Alice to Matching. Nearly mad with longing for Burgo, Glencora urges Alice to follow her heart, not society's dictates as she herself has done. Burgo and his aunt, Lady Monk, conspire to give him a chance with Glencora at Christmas. Plantagenet accepts Lady Monk's invitation, but a terrified Glencora feigns illness. Alice announces she is once again engaged to George. George manages to raise the required funds for the Chelsea seat by incurring debts he hopes to erase once he's legally entitled to Alice's money. At Lady Monk's London ball, Glencora falls into the arms of Burgo after Plantagenet leaves to return to the House of Commons. George advocates the secret ballot in his first House speech. Glencora confesses her unhappiness to Plantagenet, who responds with genuine tenderness. George shows his true colors when his grandfather's will is read. Plantagenet refuses appointment as Chancellor of the Exchequer, putting his wife before his political aspirations. As the Pallisers and Alice prepare for another European sojourn, Burgo attempts to sweep Glencora away. John Grey catches up with the Pallisers and pleads with Alice not to turn away from love. In the wake of exciting news, the Pallisers hurry home, encountering a dissolute Burgo on the way. Phineas Finn, a young MP from Ireland, begins to move in higher circles under Lady Laura's tutelage. Plantagenet is given a second chance at a coveted post. Glencora proves to be an eager and capable political hostess. As Laura continues to guide Phineas through high society, he helps her by befriending her willful brother. The underclasses become increasingly agitated in their quest for the secret ballot. Money woes force Laura to make a fateful decision, causing heartache for Phineas. Laura chafes under Kennedy's mounting religious strictures. Fitzgibbon's moneylender begins to hound Phineas for repayment. Phineas proves his mettle as a horseman, as a trustworthy friend, and, after some struggle, as a speaker on the floor of the House. His reward is a chance at another seat in Parliament. The public outcry for a secret ballot reaches a fever pitch. The Duke of Omnium and Madame Max grow closer, much to the dismay of Glencora. Kennedy demands Laura's dowry in lieu of the love she refuses to give him. Phineas continues to pursue Violet and finds himself seriously at odds with his friend Lord Chiltern. Phineas faces off with Lord Chiltern, but his plan to have Laura help him win Violet backfires. Monk persuades Phineas to use his growing power in the House to champion Irish Tenants' Rights, despite the risks to his career. Glencora privately suggests Phineas court Madame Max, while the Duke of Omnium invites her to his villa on Lake Como. Three marriage proposals are proffered, but only one is accepted, while the frosty marriage of Kennedy and Laura turns even colder. Phineas devotes all his energies to politics, only to have his indiscretions catch up with him. At his garden fete, the Duke, though feebler, delights in meeting the comely Lizzie Eustace. Laura makes a desperate escape. 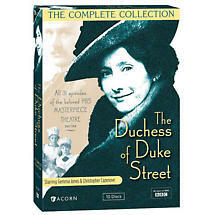 While nursing the ailing Duke at Matching, Glencora entertains him with gossip about Lizzie's flight to Scotland with the Eustace family's diamond necklace. Phineas seals his political fate by supporting Irish Tenants' Rights in the House. His domestic fate is also sealed, to the dismay of Madame Max. Lizzie entertains in Scotland and asserts her right to the necklace. Disaster strikes while Lizzie and company are en route to London and her court date. While a police inquiry proceeds, more trouble ensues. Lord Fawn reluctantly pursues the new match concocted by his formidable eldest sister, but Glencora intervenes. A new development in the robbery case promises to be bad for Lizzie. Pressed into battle by his sister, Lord Fawn makes another foray into unfriendly romantic territory. Glencora lashes out at Plantagenet, who is as preoccupied as ever with politics, to the detriment of his family. Lizzie longs for a male protector, finally finding one who may offer her benediction. Tragedy in Ireland leaves Phineas free and financed for a return to London and Parliament. Phineas visits Laura in Dresden, and Kennedy makes good on his threat to retaliate. Love preoccupies the Duke in his final days, and Madame Max proves herself to be a woman of character. Lizzie finds a new champion in Bonteen, an MP expected to become chancellor. Glencora is busy interceding on behalf of Phineas, whose efforts to secure a post have been thwarted by Bonteen. Furious over having his post snatched away, Bonteen vows revenge. Phineas hews the party line, but with no post forthcoming he's running out of resources. Bonteen travels to Prague and finds evidence supporting a charge of bigamy against Emilius. Jailed and awaiting trial on a murder charge, Phineas struggles to maintain hope. The Pallisers and Chilterns put their resources behind exonerating him, but Marie (Madame Max) emerges as Phineas's most passionate defender. Adelaide settles on an impractical match. After his trial, Phineas faces a personal dilemma. The Pallisers host two happy weddings, but a general election casts a pall over the household. A coalition Government is formed with Planty as Prime Minister. Glencora rushes headlong into her new social duties, alarming Planty. Lopez, an ambitious young man of mysterious origins, curries favor with the Pallisers and with Abel Wharton, whose daughter he is romancing. With Glencora's imprudent encouragement, Lopez furthers his political ambitions. He also obtains Abel Wharton's consent to marry Emily. When they meet at Gatherum, sparks fly between Lady Mary and Silverbridge's friend Frank Tregear. Silverbridge sees his childhood friend Lady Mabel Grex in a new light. Planty thwarts Lopez's political ploy but feels honor bound to pay his expenses. Lopez retaliates by selling his story to the newspaper. The veil falls from Emily's eyes as her husband reveals an escape plan financed by her father's money. When the news story about Lopez breaks, a debate ensues in which Phineas defends Planty and discredits Lopez. Though Planty refuses to blame her, Glencora is devastated by the trouble she has caused him. Once again, he places his loyalty to her above his political ambitions. Lady Mary and Frank secretly vow their love, while Silverbridge is thwarted in sealing a match his father approves of. Gerald is sent down from school for truancy and Silverbridge reveals stunning news about his political views. When she is taken ill, Glencora tries valiantly to keep her promise to help Mary. Her good friend Marie intercedes on Glencora's behalf as Planty sorts out his family's problems. When he understands their mother's wish for them, Plantagenet accedes to his children's choices. And the political scene beckons him once again.